Just as Malhamdale became home to cotton mills because of its available water power, this same source was harnessed again later to produce electricity, though be it on a small scale. 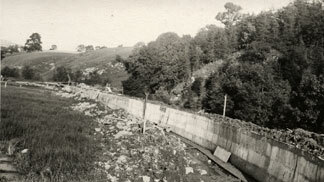 Malhamdale's hydroelectric schemes were not the earliest in the area, one had been installed in Nidderdale as early as 1891 and the Ingleborough Estate were using a water turbine and dynamo to provide lighting at Clapham by 1893, but it is believed that the first was installed here by about 1912. 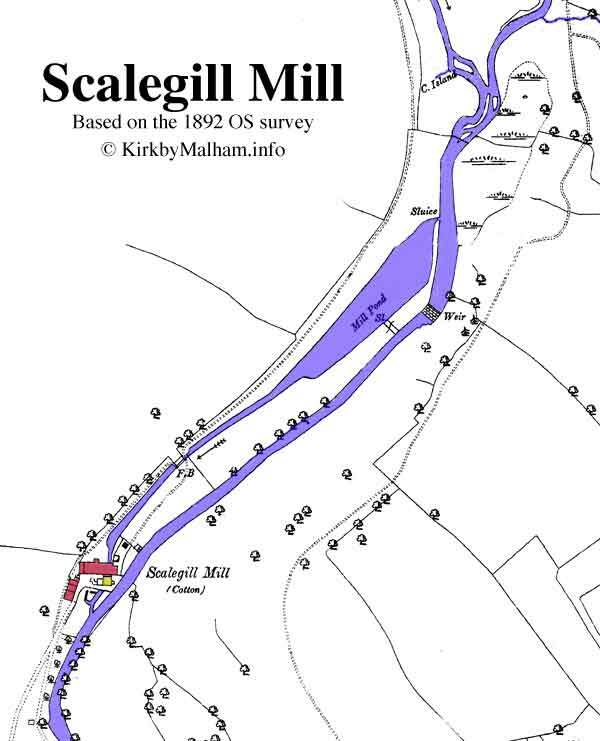 This earliest of the hydroelectric power schemes in Malhamdale was sited at Scalegill mill, part of the Hanlith Hall estate. 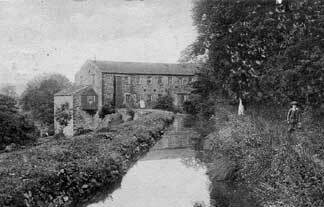 Scalegill Mill, the first site for a hydroelectric installation. for the new turbine house. When Dudley Holden Illingworth bought the Hanlith Hall estate around 1912, the mill was being used as a joiners shop and sawmill, run by the Clarke brothers. 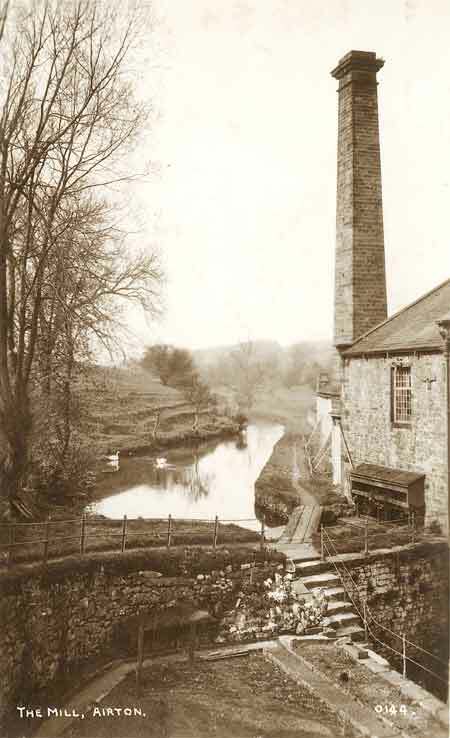 Unlike the mills at Airton and Bell Busk, the mill had never been updated with steam power and still retained its water wheel as a source of power. This was a 7ft wide by 22ft diameter waterwheel, said to develop 25HP and from the shape of the wheel pit, would appear to have been a breastshot or backshot waterwheel, which are more efficient designs using less water (see Wikipedia ). It had provided the only motive power to drive the cotton manufacturing machinery and was now powering just the saw bench and other equipment used in the estate joiner's shop. Mr Illingworth carried out extensive renovations to Hanlith Hall at the time he bought the estate and it is thought that it was at this time that he installed the first electricity generating equipment to provide some electric lighting at the Hall. He did this by using the existing waterwheel to power a dynamo, which in turn charged a bank of accumulators; lead-acid batteries fore runners to those still used in cars today. This provided a supply of about 100 volts, which was transferred by overhead wiring to run the lights at Hanlith Hall. The waterwheel continued to provide the motive power to run the saw bench, dynamo and other machinery until 1922, by which time the waterwheel was needing extensive work and the plates in the accumulators, which stored the electricity for lighting, were also in need of replacement. 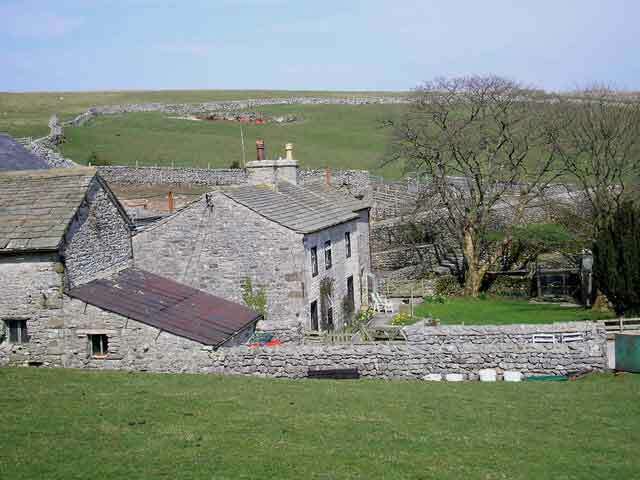 As mains electricity was still a long way from being introduced into rural areas like Malhamdale, Mr Illingworth investigated alternative means of producing his electricity and with it, the possibility of increasing the supply so that it could be used for cooking and heating as well as just lighting at the Hall. Mr Illingworth had the enquiring mind of an engineer and spent considerable time investigating various possibilities for an improved electricity supply and he had lengthy correspondence with James Gordon & Co Ltd of London, lasting 12 months from August 1922. During this time the gearing on the waterwheel actually did break and they had to resort to an oil engine to temporarily run the dynamo whilst it was decided whether to repair the existing arrangement or install a more sophisticated hydroelectric power plant. After drawing up and and costing numerous slightly differing schemes to address various concerns expressed by Mr Illingworth about both cost and efficiency, he was finally satisfied with Gordon's proposals and work began late in 1923. The waterwheel was removed in 1955 by R Thompson & Sons of Skipton and it isn't clear whether it was repaired after its failure in 1923 or just abandoned until finally scrapped. siphon pipes and belt drive for the saw. However two separate turbines were eventually installed. He cleared the silt out of the clay lined mill dam and raised the water level by installing a reinforced concrete retaining wall to the eastern side, increasing the quantity and head of water available, adding new sluices and a spillway. The latter helps in keeping a sufficient flow of water through the dam at all times to prevent it silting up. Hodkins and Jones of Sheffield quoted for supplying a foreman, two experienced concrete workers, plus the necessary cement, reinforcing, shuttering, trucks and rails etc. 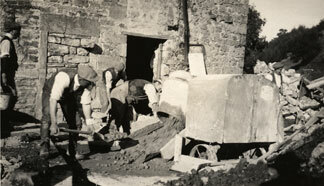 The sand and gravel for the project was excavated in Malham and transported by truck and other labour was local. Mr Illingworth managed to upset the residents of Malham by carting his sand and gravel from the quarry across the Malham village green, which didn't have a right of way across it, damaging it in the wet weather. The mill pond was cleared out and silt removed to deepen it. A concrete retaining wall was installed along the eastern edge. 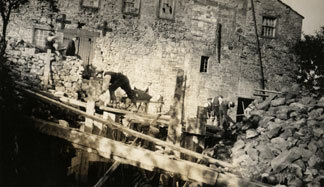 Working on the tail race race before the turbine house was built over it. 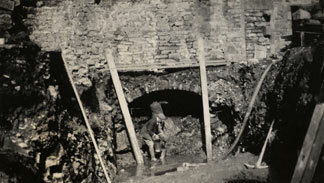 Shuttering in place on the new tail race which was widened and deepened. Starting to build the new turbine house. The head race was also deepened and concrete lined. The three storey building which can be seen standing standing in front of the mill in the first picture and the 25 inch OS map, was demolished and a new single storey extension was built above the existing tail race to house the turbines and generating equipment. The head race was also deepened and concrete lined to improve the water supply to the turbines and metal piping (the penstock) installed to take the water to the turbine house. James Gordon & Co supplied two of their type 23 Radial Inward Flow Reaction Turbines with adjustable guide vanes. These are based on the Vortex reaction turbine invented by Prof. James Thomson of Queen’s College, Belfast and patented in 1850. The design has the great advantage that it can work efficiently (70 to 75%) on any head of water from 3 to 300 feet, making it ideal for the relatively small 18 foot head available at Scalegill. The choice of turbine sizes and the adjustable guide blades, controlled by a Gordon patent oil governor, helped them maintain reasonable efficiency with a low flow of water. The final installation plans for the 2 turbines at Scalegill, which provided 24.7 HP at 700 rpm when run together, the view is looking north. The incoming water from the head race enters top left and the inlet to the turbines is controlled by manual butterfly valves. 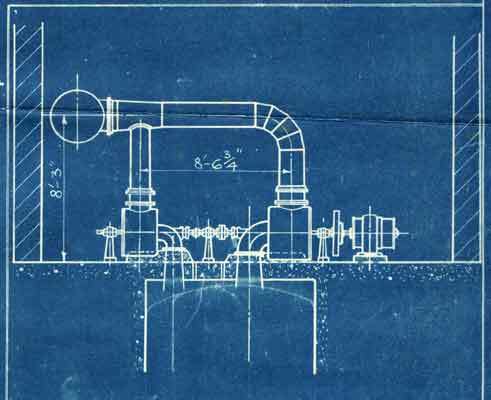 The flywheel and generator are on the right and the siphon tubes are not shown in full, but continue down below the water level of the tail race. 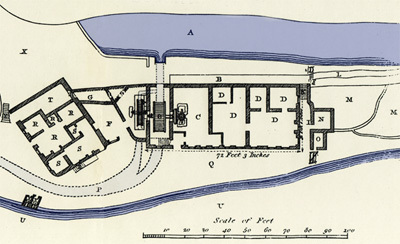 The top view on the final installation plan shows the position of the governor, the block to the right of this was a bearing supporting the gear for controlling the vanes on the larger turbine. The position allowed for an additional turbine, which was never installed, can also be seen. Reaction turbines require more accurate construction than impulse turbines such as the Pelton Wheel. They use more intricately profiled blades and profiled casings and the castings for the James Gordon turbines at Scalegill were all made in Sweden. The extra expense involved in this precision manufacture is offset by their high speed compact and efficient design and the ability to run from very low heads of water. For the technically minded, the reaction turbine is turned mainly by reactive forces rather than by a direct push or impulse from a water jet or nozzle as in a Pelton Wheel (see Wikipedia ) or Turgo turbine (see Wikipedia ). The moving blades mounted on the shaft (rotor) are shaped like aerofoils, so that the spaces between the blades have, in cross section, the shape of nozzles. Fixed blades of the same shape as the moving blades are fastened to the casing (stator) in which the rotor revolves. The fixed blades guide the water into the moving blades, and as they are also similarly shaped, also act as nozzles. As the water progresses through the nozzle shaped chambers formed by the fixed and moving blades, its velocity increases while at the same time its pressure decreases, providing the reactive force to provide the rotation. The fixed blades are actually mounted so that they can be adjusted, altering this nozzle effect to provide control of the turbine. 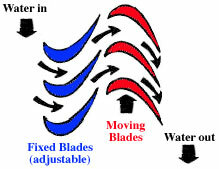 A further reactive force is produced on the moving blades when the water changes direction and there is also some impulse force on the rotor as it is hit by the water leaving the nozzles formed by the fixed blades. Two turbines were fitted at Scalegill, one rated at 7.7 HP with the 18ft head available, the other 17 HP, and they could be run singly or in combination depending on the amount of water available. The final drawings also provided for a third turbine to be fitted at a later date, though this never happened. The larger used 630 cubic feet of water per minute and the smaller 275 cfm. Mr Illingworth calculated that with an average of 1ft of water in the mill dam would run the smaller turbine, providing lighting only, for 3 hours, so he thought that sufficient flow would be achievable even when the river flow was low. Dual turbines were fitted as the turbine design runs more efficiently with the full design flow of water, losing power if less water is available. The outflow from the turbines was taken through siphon or suction tubes, the ends of which were submerged below the level of the tail race, these maximise the available head of water available for the turbines. 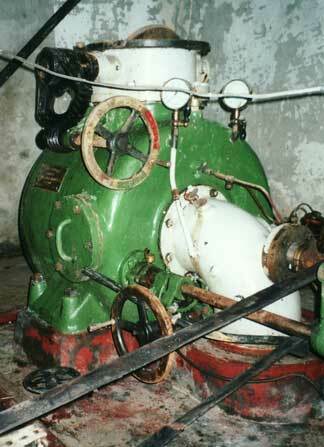 The smaller 7.7HP Scalegill turbine, water entered through the white painted butterfly valve at the top (pipe removed) and the belt provided the feedback from the drive shaft to the regulator which controlled the angle of the "fixed" vanes via the rod seen coming from the right. The James Gordon patent oil regulator, evens out the load demand and provides a constant speed for the generator. The selection of which turbines actually ran at any time was manual, a butterfly valve was fitted to the inlet port of each turbine. 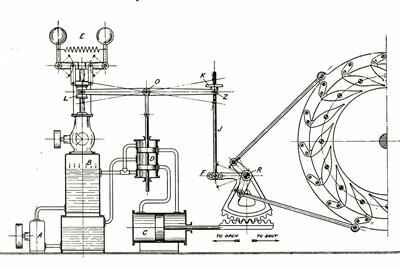 A patent governor was use to control the "fixed" vanes of the turbines to compensate for the load, and a large flywheel was also fitted to help smooth changes in the load, helping to keep the generator speed constant. 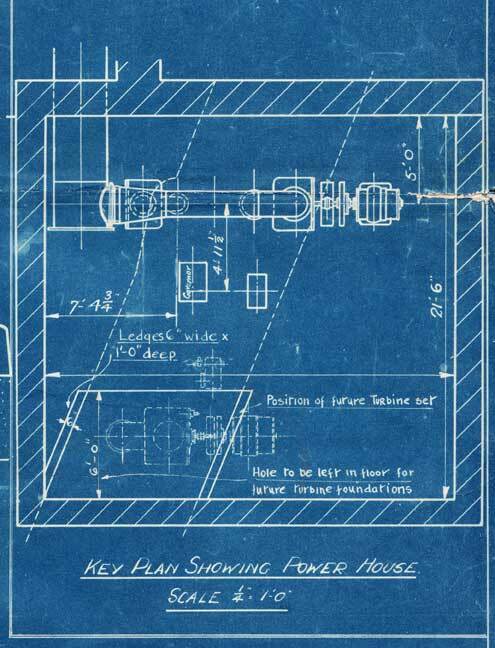 Plan of the patent oil regulator showing how it operates the "fixed" turbine blades. The original generator fitted in 1923 was a 16 KW, English Electric over compound wound, DC generator, designed to run at 700 rpm and providing a 220/240 Volt electricity supply for cooking, heating and lighting at Hanlith Hall and some power for the mill. This appears to have been changed at a later date to a General Electric alternator, probably obtained from an ex WW2 Cummins diesel generator set, providing 31 KW 3phase AC power. 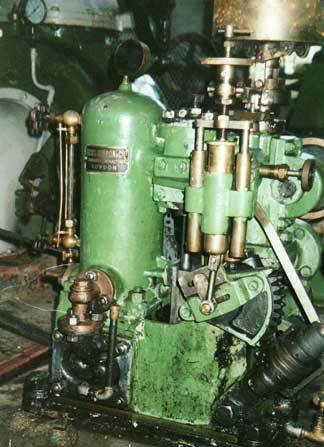 This was again changed, some time after 1960, and the final alternator run by these turbines was a Markon LC414A. The final tender from James Gordon and Co to supply the turbines, governor, generator etc. came to £650 and a few extras plus the cost of their skilled installation engineer to oversee the installation and commissioning, brought this sum up to £769. Mr Illingworth's estimate for the complete project was £1792 12s though it is not known what the final costs were. The turbines were no longer required to provide electricity to the Hall once the National Grid arrived in the Dale in 1935 and were used to power only equipment at the mill and later to run electric storage heating for the holiday flats, the poles and cables to the Hall were removed in 1960. The turbines received their last complete overhaul in 1982 and were finally taken out of commission in the 1990s. In 2001 the turbine house was converted to form part of one of the apartments at the mill, but the turbines were kept as an "interesting feature". 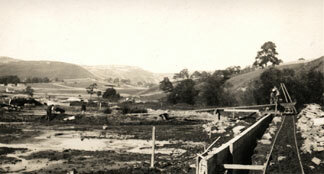 Airton Mill, the site for the Airton Engineering Co hydroelectric scheme. 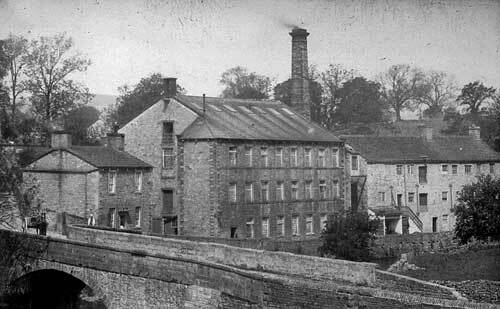 Airton mill had two overshot waterwheels by 1818, the larger was 16 feet diameter by 6 feet broad and the smaller 12 feet diameter by 3ft wide. When the new mill was built by Dewhursts in 1836/9 a huge new waterwheel was installed 25 feet in diameter and 20 feet broad replacing the smaller of the old wheels. These wheels had an unusual feed system from the head race, the water being fed first into a hopper which supplied the water to one and then the other, in turn. It isn't known whether they remained overshot, but it is more likely that the more efficient backshot arrangement was used. A boiler house and steam engine was included in the new mill and both forms of motive power ran the mill until 1904. 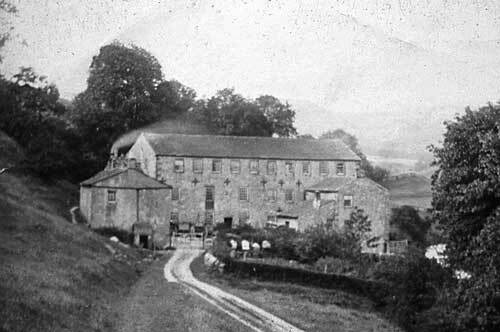 The Dewhurst's who were running the business at the time, in conjunction with their Skipton mills, then became part of The English Sewing Cotton Company and all production ceased here and the assets were passed on to the Airton Mill Company. The Memorandum of Association for this new company, registered 6 Oct 1904 stated that it was to take the mill on as a going concern for cotton spinning, winding, reeling, warping and beaming, though it is not clear that it ever did produce anything and the company was wound up in 1911. The mill was apparently mainly being used for storage during this period until the mill buildings were eventually sold. The mill had its own coal gas production and storage facility and one of their intentions was to manufacture gas and to supply and sell this for heating and lighting purposes, presumably carrying on the existing supplies to the village. Interestingly they also said they were going to generate electricity for lighting, heating and motive power, though apparently it was their successors, The Airton Engineering Company, who actually eventually did this, as a 1910 advertisement for the mill and contents doesn't mention any electric plant. the smaller was replaced by a huge wheel abt 1839 . Click image to view larger version with key. The scheme to produce electricity at Airton had a much shorter life than the Scalegill installation and started some time after 1918 when the mill was bought by AE Jackson of Blackburn. It was then run as a sheet metal and general engineering business known as the Airton Engineering Company and it specialised in ventilation and humidifying equipment for cotton, woollen and silk mills. They were also electrical engineers and at some point between 1918 and 1930 installed an electric generator driven by the existing waterwheel and which supplied the first electric lighting to the homes homes of Airton. It is not clear what the equipment was or exactly when this generating equipment was installed, but it was in production up until 1935 when mains electricity arrived, by which time the Airton Engineering Company were in voluntary liquidation. The mill's two waterwheels were broken up in 1952 by T Holmes & Co, Keighley metal merchants and they must have been substantial, because the firm estimated that there was 30 tons of scrap metal. The availability of electricity in the village led to an unique street lighting scheme being set up in 1930, which was financed not by the local rates, but by local fundraising, with dances, sales and whist drives and door-to-door collections from every householder. The street lighting consisted of about 7 lamps and in the March 1931 minutes of the Street Lighting Committee it shows that they paid Mr Jackson £8 for 2 years electricity supply. The generating equipment was tended by the mill manager and the lights went on at dusk, but when he went to bed, about 9pm, the lights went out without any warning! 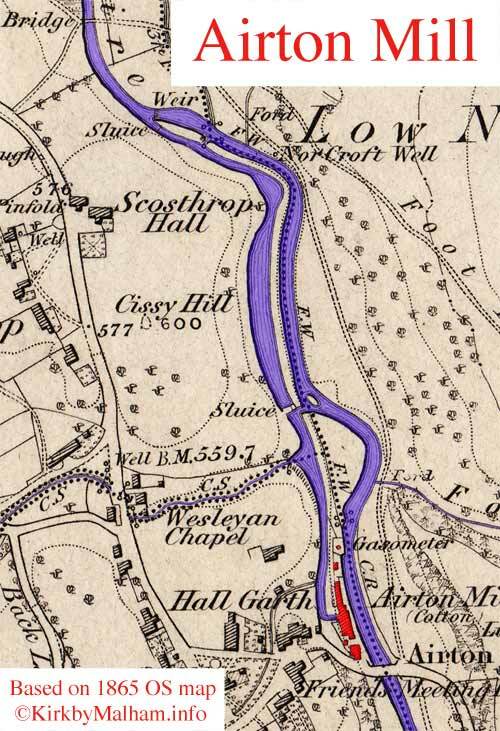 The head race at Airton Mill showing where it entered the waterwheel pit. It isn't known when electricity production ceased at the mill, but mains electricity arrived in the Dale in 1935 and when the village was connected to the mains, the Street Lighting Committee negotiated an agreement with the Settle Electric Company to buy and distribute the current, the supplier later becoming the North West Electricity Board after Nationalisation in 1947. The private street lighting cost about 2s 6d per household for the electricity and maintenance in the 1970s. The street lighting remained a separate entity and nothing to do with the Local Council or Parish Meeting until 1990, when it was finally decided to put it under the control of the Parish Council and pay for the lighting out of the parish precept. Tennant Gill, "beyond the mains" a test bed for micro hydroelectric schemes. It is possible to use an electric water pump in reverse, to supply electricity rather than pump water it is possible to use an electric water pump in reverse, to supply electricity rather than pump water, a system originally developed for use in third world areas and until recently, used locally at the National trust owned Tennant Farm on Malham Moor. Three water pump/motor units are used as turbine generators producing a 240 volt AC supply. A 1991 Flygt submersible pump/motor unit supplies 4Kw from a 45 metre head, a 1995 Pakistan built MECO unit can provide 2.8 Kw with only 15 litres per second, whilst when water is short the Worthington Simpson/Brook pump/motor combination could supply 800 watts from only 4 litres per second with a head of 62 metres. 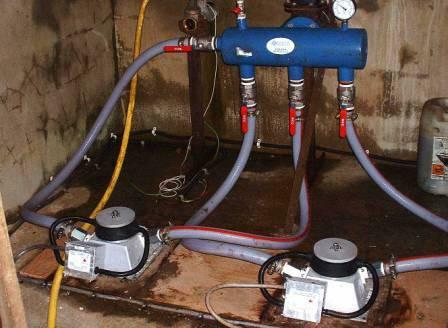 It is possible to use an electric water pump in reverse to supply electricity, rather than to pump water, a system employed at Tennant Gill Farm on Malham Moor, which still lies "beyond the mains". First installed in 1990, the micro-hydroelectric scheme at Tennant Gill, part of the National Trust's Malham Tarn Estate was one of the demonstration sites developed by the government’s Overseas Development Administration and the Intermediate Technology Development Group to test small scale generation systems developed by Nottingham Polytechnic which were suitable for use in developing countries. 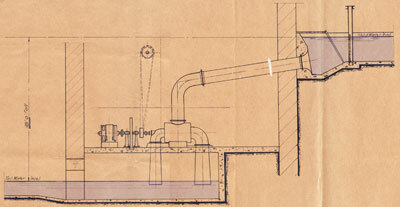 An intake tank was built on a suitable water course at the farm, with a UPVC pipe (the penstock) leading from the intake tank to the generator building, following the line of the original stream bed. The total length of the penstock, made from standard UPVC 6inch pipe reducing to 4inch diameter pipe, is 500 metres and the fall to the turbine site from the intake is 63 metres. Pumps used as turbines run efficiently over just a small flow range, so three different pumps, each designed to run at a different flow rate, were tried. These generating units use standard industrial motors for generating electricity, with an electronic controller, known as an Induction Generator Controller. All the units installed were simply standard centrifugal motorised pumps running in reverse as water turbines, with the integral motor used as the induction generator. The largest was a 1991 Flygt BS2102 HT submersible pump/motor unit fitted with a 5.2 kW motor which supplied 4kW from a 45 metre head (due to losses in the supply pipe) with an 18 litre per second flow. A 1995 Pakistan built MECO unit could provide 2.8 Kw with only 15 litres per second, and was also installed on an experimental basis. A Worthington Simpson/Brook pump/motor combination could supply 800 watts with only 4 litres per second, not suitable for any form of direct supply but good enough for charging battery banks. All the units had three phase motors which were wired to provide a 240 Volt AC supply at a nominal 50Hz. Tennant Gill's twin turbines charge a battery storage bank. The system has recently been modernised and two compact purpose built "Stream Engines" have been installed, which are Turgo type impulse turbine generators from the Canadian company Energy Systems & Designs Ltd. They employ a brushless, permanent magnet alternator which is adjustable, enabling turbine output to be matched to the electrical load, and are capable of outputs of over 1 kilowatt (kW) each, depending on conditions. The efficient Turgo turbine can operate with as little as a 3 metre head, and depending on the flow, with the head available at Tennant Gill, the pair can deliver about 1.5kW. These units are intended for charging battery systems and can be configured for 12, 24 and 48Volt battery banks. Here the output is used to charge a bank of eight 6 volt batteries providing electricity storage, whilst an invertor provides 6kW at 240 Volts AC to run the household equipment on demand. The system is also linked with a photovoltaic panel array to assist in times of low flow, instead of the previously employed diesel generator.